The Prince of Swords is a complicated character. He has a keen and penetrating mind, but he does not truly believe in anything or feel anything. His personal independence is paramount to him. He is a genius who does not think about the consequences of his actions. His attitude of “anything goes” can injure those around him. He will convince himself and others of anything using his brilliant mind. He is the kind of guy you want to have as part of your team during brainstorming, but not as someone you’d need to rely on when you need someone with a conscience. Sometimes the Prince of Swords can be so in love with his own fabulousness he becomes naive and fails to see reality. Regulus Black is a reformed Prince of Swords. He starts out seduced by Voldemort, and he is not interested in the consequences of his actions. Only when he understands the impact of his choice on Kreacher does it get through to him that he’s on the wrong side. After that he uses his truly brilliant mind to figure out Voldemort’s horcrux plot and even manages to remove one of them. Dumbledore and Harry could not have completed the task had it not been for the investigation and brave sacrifice of the mysterious RAB. 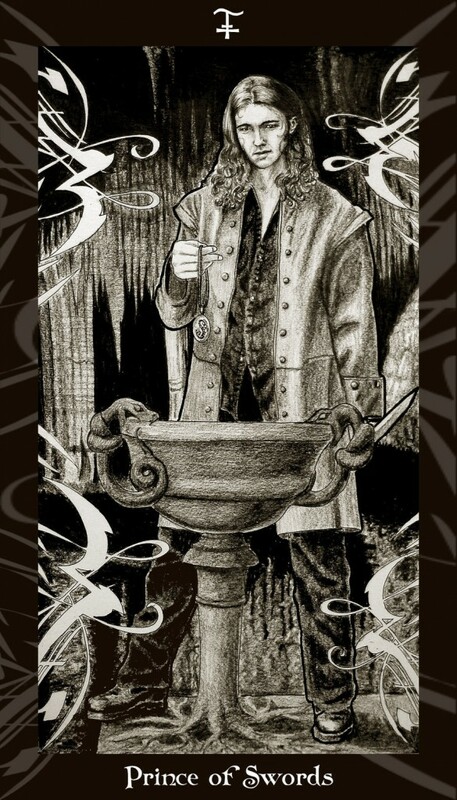 In the card we have him standing at the stone basin with the poison, contemplating the horcrux locket and thinking about actions and consequences.